I’ve been reading a blog by a guy named Derrick Miller, who wrote about his trip in and out of Christianity and, finally, to atheism. • Understanding why there are so many Christian denominations (more than 50 in Canada alone). Can I address these difficulties in a credible way? Some of them, perhaps, but not all. I don’t believe many people can, simply because they are huge topics requiring an incredibly wide range of knowledge. But there’s something larger here to address. Something that Derrick’s blog made very clear: he didn’t understand that Christianity isn’t primarily about comprehending all the Bible or the universe. It isn’t primarily about pleasing God by trying to emulate Mother Theresa or Billy Graham. And it’s certainly not about grasping all the viewpoints held by Christian churches. In the end, the things that tripped up Derrick are merely colorful, shiny billboards on the road of life. Spend too much time staring at them and, like Derrick, you’ll drive off the road and land in a ditch. I suspect if Derrick had encountered someone who could have explained this relationship and lived it out in front of him – a mentor or a Christian friend or an interested pastor, for example – then his life would have been very different. A mentor could have guided Derrick to resources that would provide a new and relevant understanding of the Bible. A pastor could have shown Derrick that while it’s great to get his act together, he (a) could never be “good enough” for God – and didn’t have to, thanks to Jesus’ death and resurrection – and, (b) he didn’t have to even try on his own. A Christian friend could have made it plain to Derrick that there have always been, and always will be, unanswerable questions. Those questions are the evidence we egotistical humans need to remind us that God is God and we are NOT. 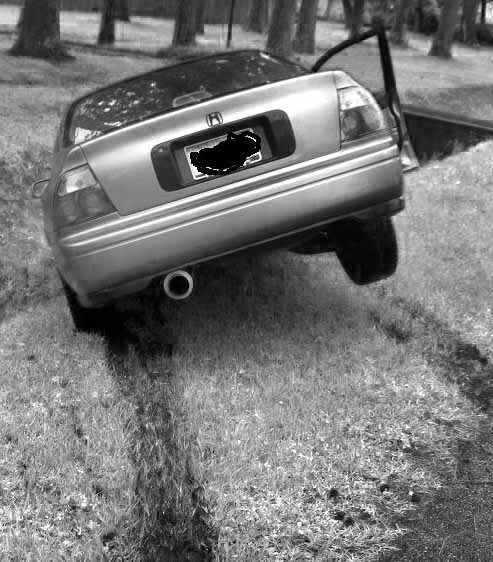 Are the things that put Derrick’s “car” into the “ditch” the same things that are keeping you from even sliding behind the wheel and turning the ignition key? Respond below and let’s have a conversation. Poor Derrick . . . Christianity is first and foremost about a relationship with Jesus. It took me a long time to realize that myself. Such a simple concept that even a young child can understand. I hope Derrick can manage to realize this and get his car out of the ditch. Great post! This is exactly why mentorship, as you mentioned, is so crucial in the church. There is definitely a time most people go through when they feel like they have to “understand” everything, especially with intellectual types. The few times I’ve been tempted to leave my faith, godly people in my life were able to keep me grounded. Love this analogy! I am going to reblog this if you don’t mind :-). There are a lot of Derricks out there, many of them are still holding on to the Christian traditions! Old school Christianity has turned into nothing more than a country club membership at the church. New school Christianity is no different than the world. I pray for Derrick and the others that they would just fall on Jesus and allow Him to work out the rest! “To me, being a Christian is being an active participant in the mission of Jesus to reconcile all of creation to the Father by living the pattern of his life, death, and resurrection out in my own life through the power of the Holy Spirit”. My theology is summed up in the “Crippled Jesus” cross I wear. Jesus has no hands and no feet but ours. No voice but ours. By wearing it, I am reminded of my mission and how I am to live. This is my answer to a skeptical world that says “so what?” to much of what the church says. “An inward turned Christianity is a dangerous counterfeit, an alluring masquerade. It is no Christianity at all. The salvation of one’s own soul, or self-sanctification, or self-perfection, or self-fulfillment may well be the goal of Buddhism or Greek philosophy or modern psychology. But it is not the goal of Christianity”. Glad to see Christians making the distinction and interrelation between church, religion, God and the great example to humanity that was/is Jesus. Though I would like to clarify that the basis of the philosophy of Buddhism is to rid oneself of desire as a goal toward the betterment of self AND relationship with and in the world at large. Basically, the key to being a better CIVILian is being a better you. Charles Colson was the writer (with Nancy Pearcey) of a book that drew me out of a skidding path towards ditching my Christianity. The book was called How Now Shall We Live and from it, I give you this quote….